Most of you know that we live in the sub tropics and one of the reasons we chose this area to live in was the annual rainfall. It wasn't the only factor in our choice of property when we bought our home, but it was one of the important ones. 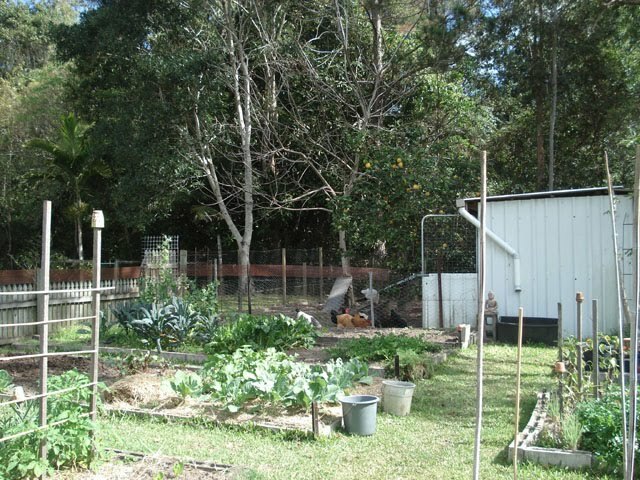 We knew when we came here that we'd grow vegetables and keep chickens, so we knew we'd need plenty of water. Our average rainfall here is 1800mm/70inches and that gives us good rain throughout the year, although most of it is in the summer storms we have. We have several dams near us and south of us that supply our state capital with drinking water. Happily, our dams have been almost full since be moved here 13 years ago, a product, no doubt, of our good rainfall. But now our State government has seen fit to build a pipeline that will take much of the water that falls here to supplement the rain that falls in the capital's catchment area. We are paying for that pipeline with our taxes, we are also now paying increased water and sewage charges. Last week we received the first of these new water bills. Get this. Even though we consume less that half the average amount of household water (545 litres/143 gallons), our bill is still $388.80 for six months. An average water bill for this area mustbe about $600! According to our bill, we use 240 litres a day here, we're under the average because there are usually only two of us here and we are very frugal with our water consumption. One of the first things we installed when we moved in here was a 5000 litre water tank. We used that tank to establish our vegetable garden and to keep the vegetables growing during times of drought. When we could afford it, and with the help of a State government grant, we installed an additional, bigger tank which now gives us a 15,000 litre water holding capacity. That water is collected from the roof on the house and shed. We have pumps on both tanks so we can use hoses on them. The water in both tanks is used for everything that needs water outside. It waters the animals and chickens, the gardens, cleans the car and house and washes some of our clothes - Hanno hooked up our old front loader washing machine to one of the tanks and that does some of our washing out on the back verandah. So why am I telling you all this? I think it's vitally important that we all have a water management plan for our homes. Even though you may think you've got the rainfall you need to manage your property, your government, like ours, may have other plans for it. Never believe that what you have now you will have next year - even something as vital or as seemingly predictable as water. 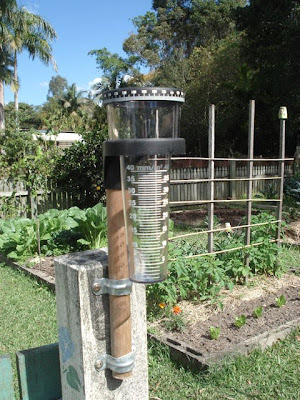 Hanno installed a rain gauge on the weekend. We use to have one but it died of old age and when it did, we didn't replace it. Getting this water bill has galvanised me into action again. We have to be even more cautious with our water now, not only because every drop of it costs us money but because, environmentally, it's a wise strategy. Our ecosystems need water to function properly so taking as little as we can for our own use helps provide a sustainable future for our wildlife and flora and our wider community. You can see here that Hanno has rigged up a very simple water catchment system on the chook house roof. The roof is only small, but when it rains, it often fills or half fills that 200 litre black bin the pipe is emptying into. We fill the buckets and watering can from that bin when there's water in it, and get it from the water tanks when it's empty. That 200 litre bin, when full, will keep the garden going for at least a week. 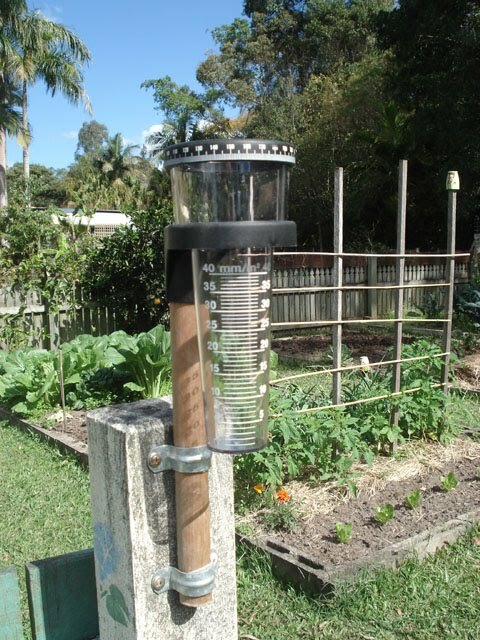 Having a rain gauge helps me stay in touch with our rainfall. It makes me conscious of what we have falling as rain and how much we have stored. I used to keep a daily spreadsheet when we had our old rain gauge, but this new one has a nifty daily meter on the top and you take your monthly record from that. Most homes have their own water meter and it's sound environmental practice to measure your water usage and try to reduce it. You can do that by collecting rainfall and using that on your garden or to clean outside. There are many other strategies to help you reduce the water you're using. Here is a chart showing average water consumption in Australia. Simple things like turning off the tap while you clean you teeth, not pre-rinsing your plates when you use a dishwasher, and for those, like me, who wash up by hand, don't use running water. Don't fill the kettle for just one cup of tea, have shorter showers and use a front loader for your clothes. All these actions save small amounts, but that's the key to this - it's small amounts that add up over the course of your six month water bill. Water conservation is something we should all be focusing on. It's not just for countries like Australia. I'm sure many of you are already wisely using the water that falls or is piped to your homes. Please tell me how you manage your water. I am hoping to drop our consumption to 200 litres per day by Christmas. My husband has been researching ways to help us recycle water we use in our home. He discovered "greywater" the other day and plans on putting in a greywater system in our house. It uses the greywater, meaning used water(like from the washer) but not water that has been used from say the toilet, which is called blackwater, and pipes it out into your yard or garden. It helps recycle the water so it goes further. It sounds like a neat concept. Not sure if you had ever heard of it. That is what we are working on at least, to help manage our water consumption. Great post, Rhonda Jean! I live in dry West Texas and I started collecting rain water 2 years ago. Not many people are doing that in this area that I know of, but I think it is very wise to do so. I have one question...I am needing to by a new automatic washer and have been told not to use homemade laundry soap in a front loading washer. Do you know why? I'm sure you probably do use it. Thanks. A very interesting article. We live completely off-grid here so agree with your water values. We are very careful with water and always put the washing up water on the plants, and don't flush the toilet unless necessary. We have a small cisterna (concrete water tank)and also a new one that Steve built, which is huge. We collect the rainwater from the house, cabin and garage roofs and it would last us all year if we were careful and also didn't grow vegetables. The rainwater which cascades down the drive when ikts raining is collected in 3 x 1000 litre cubes, which is piped down to the vegetable garden. Also Steve takes the tractor and trailer, with a 1000 litre cube on, down the lane to the village well and the cube can be filled for 50 cents, which we use to top our small swimming pool up with and also to top the cisterna up. We also collect the shower water in a large bucket during the summer and use it to water the flowers around the house. Water should never be taken for granted as it's the most important commodity we have. Could you use grey water on ornamental plants and fruit trees? No idea if using grey water is compatible with keeping chickens?? Most of our garden survives on grey water, except for a few fussy plants. We don't use greywater because we have collected enough water to use outside via our water tanks. We are focused more on saving water in the house. You should not use greywater on food plants. Cotton lady, we had our former front loader for nearly 20 years before we replace it with a new front loader. I used home made laundry powder and liquid in that old machine for about eight years. (We replaced it because the drawer was broken and we couldn't replace it.) We never had a problem with it. In the new machine, I've used home made laundry powder since I bought the machine and after a couple of years, it's still working well. I think they probably advise against it because usually machine companies have a partnership agreement with a laundry detergent company. Just make sure you rinse your machine out with a cup of white vinegar once a month to stop soap build up. If you use vinegar as a rinse aid, you won't need to do that. Our water company is threatening to raise our rates by about 240%(no typo! ), taking our bill from a reasonable $120.00(USD) to over $400. So your article is helpful. We collect rain water off the roof in large containers (moveable, like trashcans) for watering outside. The septic system has sprinklers and that gets areas of the yard. But I still end up watering from the hose every now and then. But this month, we've gotten all of about 1/2 inch of rain; I'd plan to let the garden go fallow for Aug (its just too hot to keep stuff watered), but the cayenne pepper is doing just fine. Great to find abundantly producing drought resistant plant! A bit of a wake up call for me as we don't pay for water here. We pay what is called a water/sewer/garbage of about $1200 a year. We do not pay more if we use more water. My sister however does pay for her water and found leaks in her water lines that the city had to fix because she figured out her water usage was way lower than what they were charging her for. So if you have any companies that can check you lines for leaks that's another way to reduce water waste. good morning Rhonda, We are doing some of the things you are doing and fortunately we have a fairly good rainfall as well. Our aim is to get a large enough tank to fulfill all our water needs. Our quarterly waterbill was $85.00 so our water is a lot cheaoer than yours. We will be installing our solar system at the end of the year and we are working toward almost complete self sufficiency. I was talking to a fellow yesterday who said the only things his parents bought when he was a child were flour salt and sugar. They lived in Tasmania and grew or barter everything they needed. He was telling us about the wonderful childhood he had even though they were very poor. Makes you wonder what we've done to our lives doesn't it? We have been at our little home now for just over 12 months and we are without town water. We initially had a 33,000 litre tank and were very fortunate to be given other tank of similar size. They are both concrete tanks. The second tank has only been in for a couple of months, so before we got it we had to be really careful because if we run out we had to buy water in. I'm hoping we won't run out this year. Being totally on tank water makes you really careful on how you use water. All our waste water is treated on site by Envirocycle system and then pumped out onto the trees and lawn. Really enjoying your blog Rhonda. This article really hits home for me. We live in the desert. Literally. West Valley, AZ. Our average rainfall is about 7 inches to your 70. Homes here don't even have gutters! We plan to install gutters and rain barrels this fall when it's cool enough to be up on the roof. Water is so very precious and certainly not guaranteed! We collect rain water in barrels hooked up to our roof drains. Last winter was our first doing that. There is a lot of algae build up in the barrels now. Is that something to worry about? Will the algae harm my vegetable plants? Hi Rhonda, I know your post was mainly about water management, but to me your bill is high for the amount of water that you are using. Are you or Hanno receiving a pension at all? We use around 270 litres of water a day, I'm on a Disability Pension, live in NSW and receive a quarterly pensioner rebate of $131.86. This lowers my water bill to around $65 per quarter or $260 per year. Like you, I try to utilise my water usage the best I can, though being in Western Sydney don't have raintanks etc (at the time of building our home, they were not allowable .. silly really! now they are, we haven't the place to put them as we've utilised our small block of land differently). We have a 15000L tank in Melbourne. We have hooked it to our house and we basically use it for everything except drinking water (we have a mains tap in the kitchen). 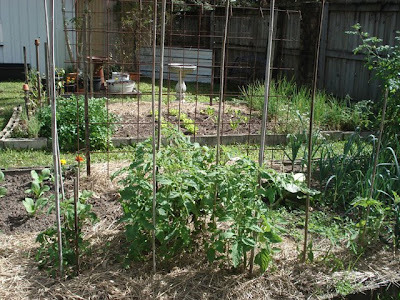 We basically live off rain water for 8-9 months of the year and in summer use it for our large vegetable garden, and in case of bush fire (we live in the dandenongs) and so revert to mains in the house. i recently had my 6monthly water rates bill which was a reasonable $46nz. the local council here is going to change to 3mthly readings and during dec - feb will doubling the charges, i was moaning about it last week but i think i will pull my head in now. (the meterman came today) weve had a lot of rain lately and we have collected 120 litres for drinking etc. we have some 1000 litre containers yet to be installed to collect water from the downpipes. its ludicrous to think that we pay to have stormwater taken away then buy it back, so we are working towards a better outcome. we are also going to capture greywater, i use soapnuts in my washer so this is safe on plants but will use this water for trees and lawn. i think the whole soap powder debate with front loaders is to do with suds. low sud varietys safe to use on f/loaders so homemade usually fall into this catagory. yes, the actual water component of that bill is only $19. The rest is for infrastructure, sewage and service delivery. Phhhhhttt! My step son's bill, in the same town was over $700. Hanno is on the aged pension and we get a $50 rebate for that. I have my own well so have no charge for water. It is an electric water pump and I do have to pay extra there, but it only comes to about $5-$7 a month. My well, my pump, my water ... right? About 2 years ago, our county was talking about putting water meters on everyone's water lines! I haven't heard anything else since about that. Gee, there must have been an uproar or something ... LOL! We do catchment from our gutters too. We're lucky to have irrigation water from our big river for our crops. We would like to hookup a gray water system to some of our plumbing as well so that our dish water and shower water and laundry water ends up watering trees and not sitting in our septic tank. Water is so precious and you are right not to waste it! What a brilliant blog today, I wanted it to go on forever! This is the second year in my tiny house, last year I monitored the water, and only used 22㎥, and got 356 Danish Kr back. As I was going to be watering the garden this year I gave in and bought a small dishwasher, and so far have actually used less water than last year at the same time. I check after winter that there are no broken, leaky pipes. Next spring I will be buying 2x1000㎥ water butts and use them for the toilet flush, washing machine and the garden. However all this seems mute at the moment, as last weekend there where floods, cars totally covered with water, cellars flooded, a whole road of people had to be evacuated from their houses, thankfully I live on the top of a small hill, so although the ground is sodden, no flooding. Today it looks as though there is not going to be any rain, I'll go for a long bike ride. Our water bills are usually around $70 per quarter in the cooler part of the year, and around $90 per quarter for the warmer half, which is very much under the average. I work in real estate and the average quarterly water bill for this area is around $250! However, we run our house on rain water - only the garden is on mains, because at the moment we dont have enough water tanks to store more water, although hopefully that will change in the near future. Approximately half our bill is water supply and the other half water usage. I am on the sunshine coast and it was a shock water and sewage $650 for 6mths. It has gone up by $250! Still waiting for the water company to ring me back because my watermeter was actually not read. 2 minute showers for the children, recycle their clothing moreie less washing. we too have a watertank but perhaps I should invest in a pump for it. Hi Rhonda, we manage the garden from the water tanks and I'm hoping to hook up the laundry later this year to those. The water bill riles me because we don't use all that much but there are, as you say, the standard fees in that. When we get a place of our own, we plan to have large water containers for runoff, similar to yours. Even with my small raised bed garden here at the apartment, most of the summer I have been able to water it with the runoff from the roof, into 2 32 gallon trash cans I set up. This past month has given us almost no rain, so I have reverted to the garden hose on the spigot. Today we are getting some much needed downpours though, so I shouldn't have to use that hose for another 2 weeks or so. huh, you think your bill is high! When we built our house we connected to our town's water supply. Then the levels of the catchment reservoir got down to less than 20 percent full and the water tasted awful so we decided to buy tanks. We have over 54,000 Litres of beautiful rainwater and are now fully self sufficient in water. We have turned the town water off at the meter and yet still pay bills of $255 every 3 months!!! We are very frugal with water and use greywater in our orchard and to water other trees and shrubs in the scorching summer months. They seem to love it. PS. I love your blog and am greatly encouraged by it. Our City's Water management company has continually raised our rates yearly. Right now, we pay every three months, and it's around $280 for 3 months, even though our usage hasn't really gone up at all. They do have a low income program, which we need to look into, but when we came here, our bill was probably about 1/2 what it is now. Another good idea for lowering your water usage is to cut down on the amount of clothing you own. Less clothes means less washing clothing that isn't really dirty. Little kids tend to throw clean clothes on the floor or in the laundry, and having fewer clothes is a good way to keep that from happening as much. And using your washing machine efficiently also keeps you from using too much water. Now I just need to get my husband on board with shorter showers, and we can really cut down! We have 36,000 litres in rainwater tanks and no mains water for the household. We also have an Ozzi-kleen toilet treatment plant which takes care of the grey water as well as the sewerage and recycles it over the garden. I have wicking beds so garden water is not wasted through un-necessary watering as the plants use only what they need and because the rest is kept in the reservoir, there is little evaporation. Its works well for us. I live in Israel, where water is scarce and expensive. One simple thing for frugal watering is to grow plants that do not require a lot of water. If you live in a dry area you'll often find local species are sturdier. Here we grow things typical to the Mediterranean such as grapes, pomegranates, figs, dates and olives. I save all the bath water and use a 'Droughtbuster' water siphon to siphon it out of the window and onto the garden. We live in the driest part of the UK and doing this has drastically reduced our water bill. We do like a bath though, not a shower, but if you have showers you could leave the bath plug in and collect the water all the same, that is provided your bathroom is upstairs like ours is of course. We also have four water butts linked to the four downpipes around our house. When I do the washing up (by hand, no machine here) I save the water in the plastic washing up bowl and use it on the outdoor pot plants. It actually over filled Saturday night. We had to let some go. One thing I will be shopping around for is some saucers to place under some large pots recently given to me. This way the over fill stays for the plant to re-obsorb. Another thing we are planning to do. watch out for the gray water in the garden. You must use great care as to what goes down the drain. Some cleaners and soaps can pollute the garden. It can also throw off the ph in your soil. put a few drops of Tea Tree oil in the laundry soap this fixed the issue. Front loaders tend to get funky odors from mold. The Tea Tree kills it! Ware an apron...This really saves on laundry. Great post. This is such an important issue that I wish more people were giving some consideration. Living in the city, I think so many people here have lost that connection with water and how every drop is so important. I still see people hosing leaves down gutters to "tidy up", or washing cars on concrete. Makes me hop up and down with irritation. Renting a flat in a city doesn't let me do all the water saving that I would love to do, but there are little things that can be done. eg. attaching an airator faucet in the kitchen tap- couple of dollars and instantly using less water. Amen! What a great way to preserve, i've wanted to try this myself. We really need to conserve all over the world. i think many take for granted it will be there always, but others already know how precious it is when they lack decent water. We pay about $50.00 a month for our water. I really like your idea. Thanks for sharing. I really love your blog. My husband and I try to live a slow life amongst the city and I think it doing our son alot of good. The previous people who lived in this house had a $2000 water bill over the summer (3 months! I guess they used a lot of water while the house was on the market, keeping everything green. 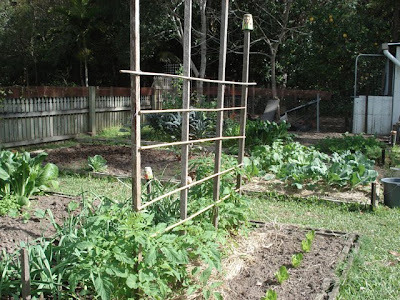 Suffice to say we will not be using any water on the garden apart from the vegie patch. I feel kinda silly because I never really thought about it. I don't pay for water either. Well, I do, but it's for "water, sewer and garbage/recycling" and that's about $63 a month. I do know that would go up if I needed a bigger garbage can or more recycling containers. (I just use rubbermaid containers of my own). I do collect rain water but I don't know what I'm doing wrong...if I don't use it right away it usually ends up getting funky and slimy even though I keep a screen on top of it and out of the sun. In our apt in the city we just watch our water usage. We take showers not baths and not everyday. We turn the water off when we brush our teeth, little things like that. At the lakehouse, we have a well, and an old grandfathered in septic system, that is basically a cesspool, when we flush, it goes into the backyard. The well is in the front yard, and gets full of water. We have a reverse osmosis water filter that we use for that water though, we don't just drink it straight. We don't pay a water bill at the lakehouse, just the electric to pump out the water. I forget sometimes how lucky we are to have that. Its a great idea to have a rain catcher, for watering plants etc, we'll have to get one of those! ps i love your garden! Rhonda, you should get a bucket and measure how much water your shower uses in a minute. If it's over 9L a minute you have an old shower head. Some local councils have a shower head exchange program or you can use the Climate Smart Home Service program to get new ones in Qld. Or of course, buy a new shower head. It will save water and electricity costs (not heating as much hot water for your shower). I like this solution because you make the decision once and then rep the benefits for ever more. Good luck. Candice, thanks for your suggestions. We have been using water saving shower heads since we moved to this house 13 years ago. We've had the Climate Smart audit, and have the meter to help us check our electrical usage. We have solar hot water and have used solar hot water for the past 25 years.